The administrators of First Quench have warned of store closures and job cuts. KPMG said 81 redundancies had been made at the firm's head office in Welwyn Garden City, and warned that more jobs were likely to go. 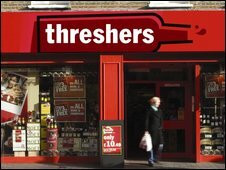 First Quench, which owns Threshers, The Local, Wine Rack and Haddows, went into administration on Thursday after struggling in the recession. Its stores have suffered from increased competition from supermarkets and from stock problems earlier this year. "Unfortunately it is likely that some store closures and further redundancies will be made," KPMG said in a statement. But it added that no stores had been closed yet, and said that it was looking for a buyer for the business. "Trading in the off-licence sector has become increasingly competitive in recent years, with the recession proving too much of an additional burden in this case," Richard Fleming, UK head of restructuring at KPMG, said. "We will continue to trade the remaining business while we seek a buyer." First Quench has 1,202 stores under its various brand names, and employs 6,283 workers. Another 86 stores, employing an estimated 430 staff, are run as franchises and have not been placed in administration, as they operate as separate businesses owned by their own management.